Ayurveda means “the science of life” in Sanskrit. It is a system for health and well-being that comes from ancient Indian texts many thousands of years old. Regarding health, it emphasizes balance and prevention, rather than sticking a bandaid on symptoms. It is a holistic body of knowledge with a deep understanding of digestion, routine, and natural remedies meant to utilize the body’s natural intelligence to balance or re-balance. I was lucky to get exposed to many principles of Ayurveda very young, through my father who learned deeply about it and injected many practices into our little two-person family when I was still a child. He rubbed oil on my feet at night to help me sleep; he brought essential oils to the hospital when I was recovering from surgery and feeling nauseous; he made healthy lunches with special foods to balance my body type; he even brought me to see Dr. Nancy Lonsdorf, a premier MD and Ayurvedic physician who had a clinic in Washington DC at the time, when I was still a child. I feel very lucky for this. I feel deeply in my bones that it has had a powerful benefit for my health. Back in the day, most people still looked at you like you were crazy when you talked about holistic medicine, balancing your doshas, or Ayurvedic recipes. Now, when I tag Instagram posts with #ayurveda, people from all over the world respond. But I was fortunate to stumble upon that holy grail early. It is July. I am staying at The Raj for a month. For me, it is a reset after a very rough year. I have given myself the gift of an amazing wellness retreat: one part deliberate isolation, one part total health overhaul, and one part connection with some amazingly beautiful new people. First off, there is the location. Located unpredictably in the cornfields of Iowa, it is a beautiful and removed spot, with a double tree lined drive leading to a glowing, stately building. It feels settled and peaceful here. 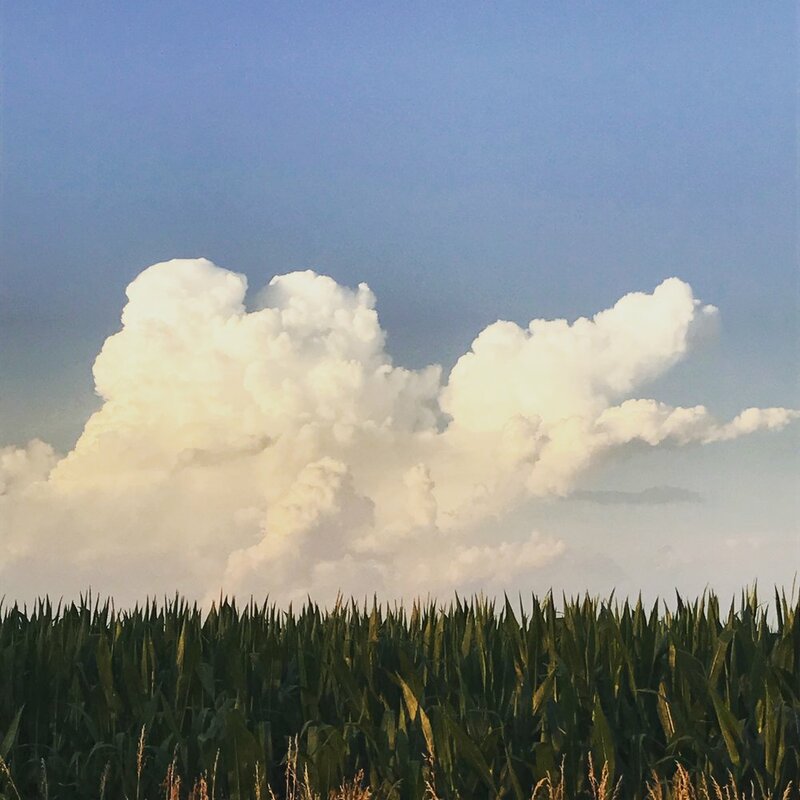 There are the amazing Iowa skies, 360 degrees of billowing cloud formations and Van Gogh sunsets. I have a sunny, peaceful, corner room overlooking a pond. Here I can write, I can turn off my alarm, I can open the windows and listen to the frogs at night. Then, there are the treatments. The Raj is a premier Ayurvedic clinic, offering panchkarma, which is a detox program that is kind of like getting a new body (except it feels nourishing and comforting, rather than like you’ve been hosed out with a vacuum cleaner and starving, unable to eat anything except green juice). Panchakarma does involve luxurious day spa treatments, but here it also means detoxifying from the inside out: you start before arriving with a very purifying Ayurvedic diet, some herbal preparations, and you remain on the very restricted Ayurvedic diet while here, which is super easy to digest while you are going through all this purification. And yes, there are “colonics,” although I hesitate with that word because of the aggressive hose-you-out connotations. These are oils and herbs meant primarily to nourish from the inside out, not deplete you. Dr. Mark Toomey is the health expert here, and he guides the treatment program for each individual, so it is tailored to your body type and imbalances. Also, he is the most grounded, wise, kind, and competent individual, and he makes you feel cared for like a queen. The Raj attracts a special crowd. People come here from all over, for all different reasons, and with all different exposures to Ayurveda. Some couples are devoted regulars who come every year. Then you’ll find newbies, like the two ladies from San Francisco I met who have been friends since kindergarten, Googled “Ayurvedic spa,” and decided in solidarity to come together, never having any exposure to this before. They were a hilarious duo. My new friend Darlene is the youngest, spunkiest 70-year-old I've ever met and from LA. Her son was taking a meditation course nearby and she tagged along. We got along famously and went on outings together. When she left, she hugged me and said, “I almost feel like you’re my daughter.” I am now going to visit her in LA in September. Cynthia (of the “-ationals” raves) arrived for a few days’ getaway from her job as a health care consultant to physicians. She has a high stress job but brought this incredibly soft, light, open energy with her, and a hilarious sense of humor — she learned Transcendental Meditation while she was here, cried when she left, and sent white roses to the rest of us here afterwards, with a note “For My PK [panchakarma] Peeps.” We’ve stayed in touch too. I feel like my Summer of Self Love is resetting something. It is a long dip into something nourishing and filled with ease. It hopefully will have lasting tangible health benefits, but it is also a kind of “pulling back the arrow” for me at a major life transition. I did not choose to go frolic around Cabo for a month, lie on the beach, drink a bunch of cocktails and bake them into my liver with lots of sunbathing. There are certainly fun things about that, but I wanted my wellness retreat to be about doing the very best things for my body that I could, and also about putting myself into an environment where I could cultivate more silence. Go deep, nourish, and revisit what it means to live with ease. Those were my goals. The Raj has been a wonderful place to achieve that.